Hitchcock/Truffaut is a new documentary, directed by Kent Jones, playing at the Music Box Theatre, 3733 N. Southport Ave., Chicago, IL, through December 31, 2015. 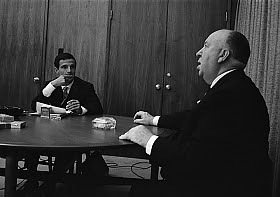 Based on the original recordings of this meeting—used to produce the seminal book “Hitchcock/Truffaut”—this film illustrates the greatest cinema lesson of all time and plunges us into the world of the creator of Psycho, The Birds and Vertigo. Hitchcock’s singular vision is elucidated and brought vividly to life by today’s leading filmmakers: Martin Scorsese, David Fincher, Arnaud Desplechin, Kiyoshi Kurosawa, Wes Anderson, James Gray, Olivier Assayas, Richard Linklater, Peter Bogdanovich, and Paul Schrader. For more information, including show times, click here.